Not to be confused with Nezperce, Idaho. St. Stanislaus Catholic Church in Lewiston. Nez Perce County (pron. Nezz Purse) is a county located in the U.S. state of Idaho. As of the 2010 census, the population was 39,265. The county seat is Lewiston. The county is named after the Nez Percé tribe. 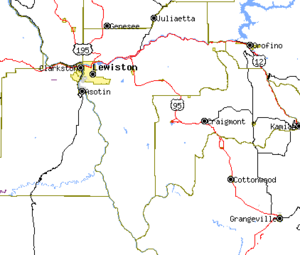 Nez Perce County is part of the Lewiston, ID- WA Metropolitan Statistical Area. Nez Perce County was originally organized in 1861, when the area was part of Washington Territory. It was reorganized in 1864 by the Idaho Territorial Legislature and was later subdivided into new counties. Rapid migration to the Palouse in the 1880s led to the formation of Latah County in 1888. Isolated from its county seat of Wallace in the Silver Valley, the southern portion of Shoshone County was annexed by Nez Perce County in 1904, then became Clearwater County in 1911. Lewis County was also formed from Nez Perce County in 1911. Nez Perce County has two rivers, the Clearwater and the Snake, which meet in Lewiston and then flow west. The Clearwater flows from the east and the Snake from the south, creating the state border with Washington (and further upstream, Oregon). The lowest point in the state of Idaho is located on the Snake River in Lewiston in Nez Perce County, where it flows out of Idaho and into Washington. North of Lewiston, Idaho's western border is a political line. The northern portion of the county is part of the Palouse, a wide and rolling agricultural region of the middle Columbia basin. Nez Perce County is currently strongly Republican, though less so than southern Idaho: it is one of only nine counties (out of forty-four) in Idaho that has failed to vote Republican in any presidential election since 1968,  and indeed supported Dukakis and Bill Clinton (by plurality) three times in succession from 1988 to 1996. As of the census  of 2000, there were 37,410 people, 15,286 households, and 10,149 families residing in the county. The population density was 44 people per square mile (17/km²). There were 16,203 housing units at an average density of 19 per square mile (7/km²). The racial makeup of the county was 91.58% White, 0.28% Black or African American, 5.31% Native American, 0.65% Asian, 0.07% Pacific Islander, 0.50% from other races, and 1.60% from two or more races. 1.93% of the population were Hispanic or Latino of any race. 25.1% were of German, 11.3% English, 11.0% American, 8.9% Irish and 5.6% Norwegian ancestry according to Census 2000. There were 15,286 households out of which 29.00% had children under the age of 18 living with them, 52.80% were married couples living together, 9.30% had a female householder with no husband present, and 33.60% were non-families. 26.70% of all households were made up of individuals and 11.30% had someone living alone who was 65 years of age or older. The average household size was 2.40 and the average family size was 2.90. In the county, the population was spread out with 23.80% under the age of 18, 10.00% from 18 to 24, 26.70% from 25 to 44, 23.00% from 45 to 64, and 16.50% who were 65 years of age or older. The median age was 38 years. For every 100 females, there were 96.70 males. For every 100 females age 18 and over, there were 93.80 males. The median income for a household in the county was $36,282, and the median income for a family was $44,212. Males had a median income of $34,688 versus $23,014 for females. The per capita income for the county was $18,544. About 8.60% of families and 12.20% of the population were below the poverty line, including 15.40% of those under age 18 and 6.70% of those age 65 or over. ^ a b "State & County QuickFacts". United States Census Bureau. Archived from the original on July 15, 2011. Retrieved July 1, 2014. John M. Henderson and William S. Shiach, with Harry B. Averill, An Illustrated History of North Idaho: Embracing Nez Perces, Idaho, Latah, Kootenai and Shoshone Counties, State of Idaho. n.c. [Chicago]: Western Historical Publishing Co., 1903.